Isn’t it wonderful how far we’ve come along with technology for cars? I mean we have cars that run on electricity, power from the sun, and even vegetable oil. Now we have cars that actually go on land and in water-it’s actually been around for a while, but people are always wanting to improve it; kind of like how people are always improving computers. 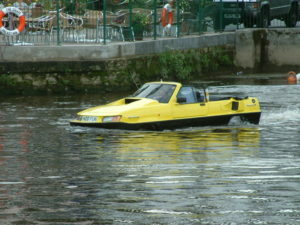 These cars are called Amphibious Cars and have been used mainly for warfare. One of the first amphibious car dates all the way back to the Neapolitan Prince Raimondo di Sangro of Sansevero, which was in 1750. In 1805, a man named Oliver Evans designed the first amphibious vehicle that was self-propelled and steam-powered-this was called the Orukter Amphibolos (it’s sounds super cool, right?). Similar to the history of the wheel, there’s is no specific name that was recorded in regards to who was the very first one to invent this device, but researchers do know that the expansion of this really began in 1899. When the late 1920s rolled around, they decided to really combine the automobile and the boat. When they first realized that they can integrate these two things, they just put the axles and the wheels on something called the boat hull; but we have obviously come so much farther since then. Since they first started designing and improving them, they have invented some with specific purposes like search & rescues, expeditions, but mainly the military. When the W.W.II rolled around, the two most important amphibious cars were invented. One was called the German Schwimmwagen. I know it’s a weird name, but just bare with me on this one. It kind of looked like a small 4×4 Jeep that was actually designed by Porsche in 1942. The second one was called the Amphi Ranger that was also German. It was made out of Aluminum called AIMg2 that was sea water-resistant. I have no idea if they still make wheels like that for models such as the regular Land Rover Wheels, but you never know, right? Anyway, only about 100 were built-which means that they were most likely really expensive and pretty changeling to make. Most people don’t know that a great number of land vehicles can be amphibious by simply installing them with a waterproof hull and a propeller; but let’s not get any crazy ideas. The way the car propels is done merely by spinning their wheels or using water jets (also known as screw propellers). As of now, there are many countries that have developed their own amphibious vehicles and have actually offered tours on these lovely cars. The countries include Japan, Canada, and even Budapest… where the Parliament is located. The Hovercraft is the most commonly known amphibious vehicle that’s mainly used by the military. It’s called an ACV (Air-Cushioned Landing Craft) that is created to obviously travel in land and water; it’s supported by low-pressure air that’s released below the vehicle. Technically, the Hovercraft can work on anything smooth, rough, and everything else that you can possibly imagine… kind of.